I recently found this video of a giant air vortex 'gun' from Japan, and had to share it. 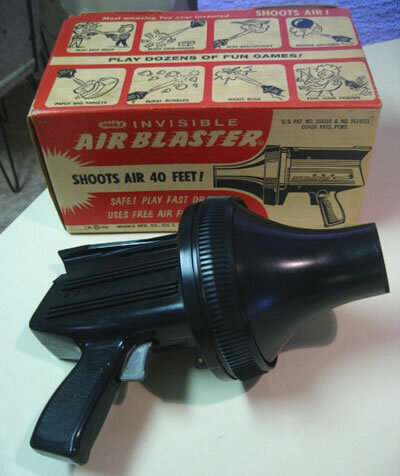 I think it's because I received a smaller version when I was a child - the Wham-O Air Blaster. The Air Blaster created a ring-vortex, an invisible smoke ring of air, and shot it towards a target. Air was compressed and set in the mechanism by pushing down the hand lever at the top of the toy. My grandfather smoked cigars, and would put a puff of cigar smoke in as I readied the Air Blaster. I pulled the trigger, and could then see the vortex of air as it moved toward its target. It turns out that Japanese air-vortex enthusiasts have created giant versions of the same 'weapon." Take a look at the video below, which shows the device working on targets more than sixty feet away. I know that this device does not hold a candle to some of the other weaponry I've discussed on this site, but I still like it. The Wham-O Air Blaster was one of the most futuristic-looking toys I had as a child, and I remember it fondly. Now where can I get one of these for my twelve-year-old son?